Recoil management is an essential part of accurate pistol shooting and the key to managing recoil is a tight two-handed grip. For the average shooter, however, it’s easier said than done, so let’s walk through the process to ensure your grip is good as gold. Advice that’s often passed down is a good grip begins in the holster. What that means is before you draw, you should focus on establishing a high, firm grip on your pistol. When I say “high” I mean the web of your thumb and index finger should land right below the slide and the firmness comes when your fingers grab the rest of the grip. Once you draw, wrap your support hand over your dominate hand. Let your support hand cup the dominate in a natural position (most people find pressing the pads of their hands together and fingers over knuckles a natural position). This creates pressure and friction on the grip that allows you to control the pistol more efficiently during recoil. Finally, make sure that your thumbs align on the side of the frame. Dominant over support. Next, it’s time to shoot. 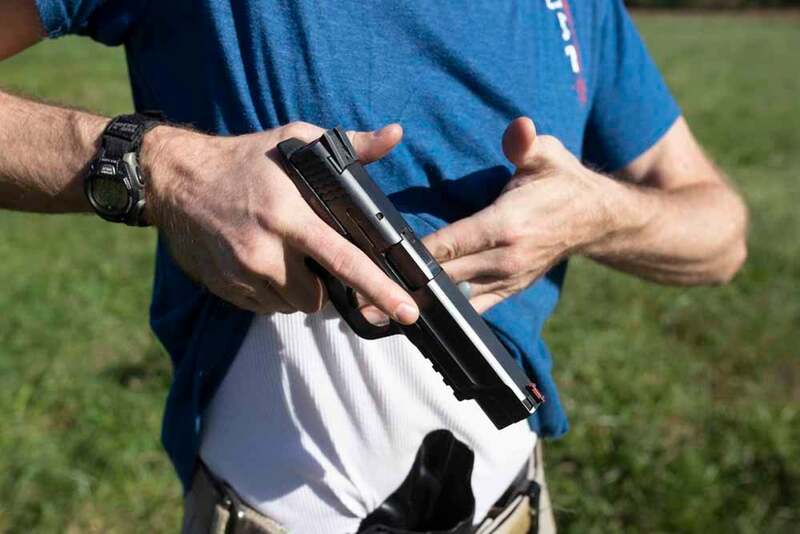 When your grip is high and firm, it allows your hands to control the energy used to push the round out of the barrel and, more importantly, control the backwards energy used cycle the pistol. With your hands positioned correctly, you better absorb that recoil and limit movement so it’s easier to set yourself up for a follow up shot. To master this skill, begin by practicing your draw slowly. That will allow you to think through each stage from the grab to the draw to the pull. As with any skill, mastering pistol shooting means mastering the fundamentals. The post Manage recoil with a tight, two-handed grip (VIDEO) appeared first on Guns.com.